Dragon Mounds are ancient dragon burial sites that dot Skyrim's landscape. In appearance, they are simply large, flat, circular areas created out of two rings of paving stones. There are no map markers associated with the dragon mounds, and early in the game there is no indication that there is anything remarkable about these features. They built the dragon mounds, entombing the remains of dragons that fell in the war. They believed that one day the dragons would rise again and reward the faithful. The Atlas of Dragons notes the location of a few dragon mounds, but there are few other surviving records of them or their locations. When the return of the dragons spurs a renewed interest in dragons, the only way to locate all the mounds is to retrieve an ancient Dragonstone from Bleak Falls Barrow. 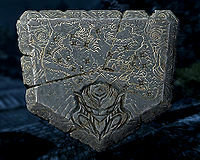 The back side of the stone shows a map of Skyrim, with stars representing the location of each dragon mound. 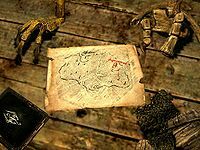 Delphine transcribes this information onto a Map of Dragon Burials, although Delphine's map is less accurate than the original stone (for example, the mound near Dawnstar is missing from Delphine's map). For more detailed information on the location of all dragon mounds, see (map). For a list of these locations, see this page. As the Main Quest progresses, you learn that the dragons buried in the mounds are not truly dead, and that they are now rising up again. During A Blade in the Dark, you witness this happening when Alduin raises Sahloknir from his mound, located east of Kynesgrove (map). From this point in the game onward, dragons will proceed to emerge from their mounds. This page was last modified on 10 March 2014, at 14:30.